St. Joseph Catholic Church is significant for both its architecture and its history. Designed in Romanesque style, Milwaukee Wisconsin architect Anton Dohmen designed a total of 5 North Dakota churches including St. Mary's at Assumption Abbey in Richardton, ND. He also submitted the original design for Bismarck's Cathedral of the Holy Ghost, only to have it later rejected. 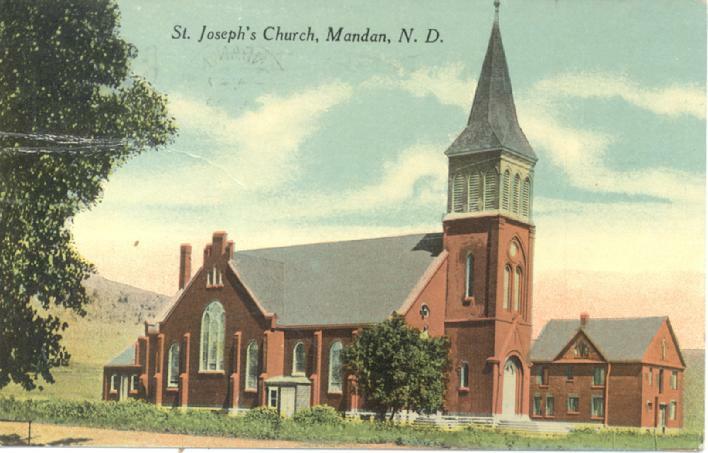 Mandan's first Mass was held in 1879 at the Linnehan residence and celebrated by Father Valentine Sommereisen. The parish was organized in 1881 and steps were taken to secure land for a church building in the midst of the "Catholic settlement" within the city. That fall, active work was begun on the building situated on the corner of Stark Avenue (now Collins Avenue) and 3rd Street. The building was completed in October of that year and was originally intended to answer the purpose of a combined Catholic school and church. Owing to the size of the congregation, the original plan had to be modified. The Reverend Father Cassidy - previously of Yankton, DT - had been connected with the parish since its organization. In 1884, he was reported to be residing in a rectory which had been added to the original church building. 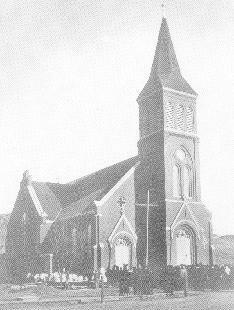 Although originally a heavily Irish-influenced congregation, by 1892 German's from the Ukranine began arriving in Morton County, and in the next decade shortly after St. Joseph's first church was completed, church records indicate requests for a German priest and the use of German in services in confirmation instruction. The selection of the German-born Anton Dohmen by the Irish-born priest to design the church may have been an attempt to address the desire for more German influences in the operation of the parish. The cornerstone was laid in April 1904. A tin box beneath it contains relics from Lourdes, Rome, Bethlehem, Jerusalem, Mount of Olives and the River Jordan. The construction of the current church building was spear headed by Father Daniel Collins who personally loaned $13,500 toward the $40,000 construction cost. Upon his death in 1909, he was interred in a vault located in the basement. The church was dedicated in November 1904 by Bishop John Shanley, North Dakota's first Catholic bishop The church seats 725 and has a tower/steeple with a height of 114 feet. The original interior was very ornate, making extensive use of stencils to decorate and define the vaulted ceiling arches. The decoration was very similar to the churches the immigrants would have known in Europe. Constructed originally with native rock, Kosota stone facings and Menominee brick from Wisconsin, a narthex was added to the front in 1974 to create a "gathering space" consistent with new Catholic Church design criteria subsequent to Vatican II. The original stained glass windows, most likely designed by Karl Riemann a Milwaukee artist in collaboration with the architect, remain. Their designs are depict "devotional" rather than traditional "narrative" storytelling themes which makes them very unique. The windows honor saints and many are dedicated to the pioneer priests from throughout the region.